Maria Tillberry has been serving the Monument community for over 18 years and her staff has over 80 combined years of experience! 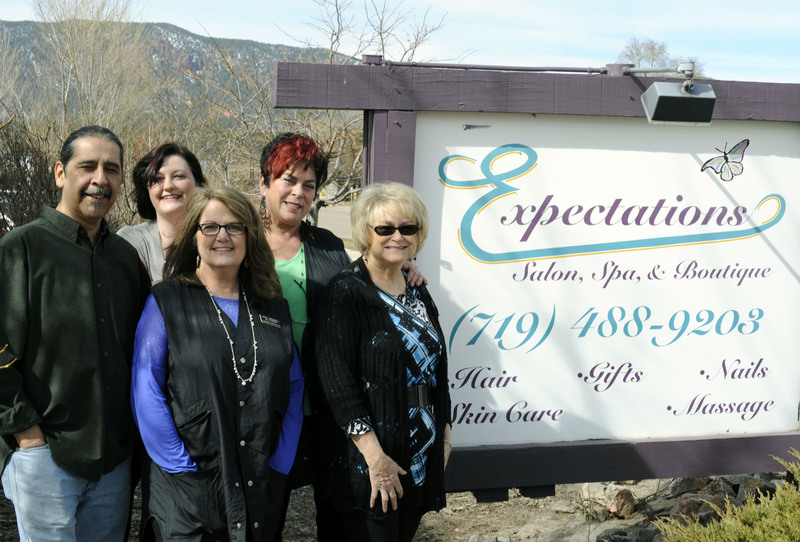 You will feel right at home at Expectations Salon and Spa, where you can expect the best. Kathy is a nail tech with integrity. Her work focuses on beautiful and healthy hands and feet. She uses top of the line products because her customers deserve the best in quality, pampering and results. Safety and sanitation are top priority. With 30 years of experience Ron will work hard at giving you the look you want. Trained in California, he is reliable, experienced and dedicated to hiswork. Cindy, also with over 30 years experience, is a joy to have on our team. They will give you the personalized, professional care that you deserve. Juli was born and raised right here in Monument. She is an experienced Massage Therapist and specializes in deep tissue, Swedish, pregnancy and hot stone massages. Her goal is to help you achieve maximum benefit from your massage: either therapeutic or relaxing. She is highly recommended by chiropractors and other specialist in the field. And then there is Maria, the owner and Aesthetician since 1975. Before opening Expectations she worked at European Skin Care in Colorado Springs for 14 years. Prior to that, she worked in her native country, Spain, for six years where she received her degree. Quality, knowledge, experience and understanding is what you will get with Maria.